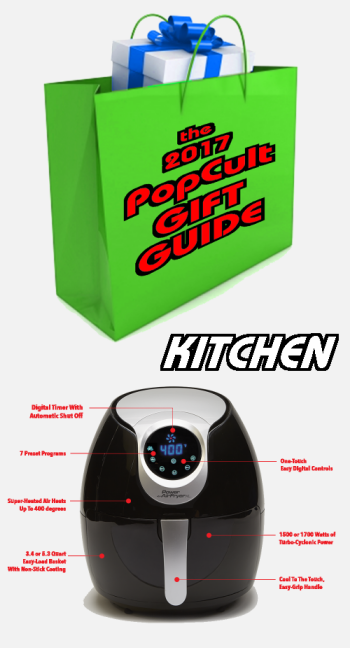 Our next pick in the 2017 PopCult Gift Guide is a kitchen gadget/appliance that I’ve become quite fond of in the months since I decided to gamble on it. The Power AirFryer XL is one brand of the popular new fad that lets you fry food with super-heated air. You can get by without using any oil (or very little, if you want some for flavor) and you can cook a surprising variety of different items in them. I’m recommending the Power AirFryer XL because that’s the one I have. I understand that other brands are of varying quality. Remember, you get what you pay for, and while you may find less expensive Air Fryers out there, they may not work as well as this one. This is the perfect gift for the cook on your list who’s open to trying new things. This particular Air Fryer can be found at prices ranging from under a hundred dollars to just under two hundred, depending on the size and the store. “The secret to the Power AirFryer XL is Rapid Air Technology. The Power AirFryer XL surrounds your food with a Whirlwind of Turbo Cyclonic Air instead of butter, oil or lard. You get the same, golden-fried taste & texture you love. With little to no oil, no trans fats, and no greasy mess of a deep fryer! ANY of your favorite fried foods can be made with fewer calories from added fat or oil. It sounds like hype, because it is ad copy, but it’s also true. I’ve used this on french fries and chicken tenders, and it could pay for itself just making those two items. However it’s also great for biscuits (the canned variety), various breads, fish filets, pizza rolls, corn on the cob, small frozen pizzas and Bagel Bites and more. I haven’t had time to try it on more adventurous things like beef or fresh chicken, but I plan to in the future. Like I said, it’s the perfect gift for the tech-savvy cook on your shopping list. You can find it at many retailers who sell small kitchen appliances, or order it from their website (you’ll probably get the best price at another retailer during the holiday sales).